Jaipur : While celebrating 40 years of successful entrepreneurship of its founder Nand Kishore Chaudhary and its network of 40,000+ artisans, Jaipur Rugs is gearing up for its next journey. Jaipur Rugs has already created success through various retailers across the globe. Its rugs find themselves on the window display of eminent retail stores in more than 135 cities across the globe. With its eclectic modern collection of hand-made rugs out of natural fibers such as wool, silk, cotton, jute, hemp, etc. the company is all set to open B2C retail stores in major metros across the country and plans to reach out to a larger pool of potential buyers through eCommerce platforms. Presently the company carters to the dreams of Indian consumers through it’s retail stores in Delhi and Jaipur. NK Chaudhary, Founder and CMD of Jaipur Rugs says, “Integrating current designs with the sustenance of our communities, Jaipur Rugs brings weaver’s art directly to homes and delivers not just a carpet but the blessings of a family. Jaipur Rugs offers a curated line-up of contemporary to transitional and eclectic carpets handmade in rural India. The goal of Jaipur Rugs is to bridge the gap between the two ends, the weaver at the grassroots and the urban consumers, by starting a dialogue." "We bind the lives of the weavers and the consumers through contemporary international designs and celebrate the revival of the dying art. A Jaipur Rugs consumer not only owns a piece of art that they can walk on, but also get connected with the emotions of the weavers imbued in each knot. Every rug purchased has the emotions and the story of an artisan who has woven it, embedded in its knots. Our goal of raising the value given to the artisans will be based on a great combination of design, quality and pricing that suits Indian households,” he added. The company has grown from just 2 looms to 7000+ looms spread across 600 locations mainly in the states of Rajasthan, Gujarat, UP, Bihar and Jharkhand. Company’s turnover has crossed Rs. 130 Crore of which only 5% accounts for the Indian retail market. Under the leadership of NK Chaudhary, the socially driven business model has created a bridge between global customers and 40,000 rural artisans spread across villages in North and West India. Over 80 percent of the artisans are women and about 7,000 belong to tribal areas. At present, Jaipur Rugs operates an end-to-end business model, right from sourcing of wool to exporting a finished handmade rug. The company buys wool from many countries, including India, and then gets it handspun by artisans in and around Bikaner, Rajasthan. After dyeing, the wool is sent to the company’s network of weavers who get paid monthly. Jaipur Rugs is known for its hand-knotted rugs as well as flat-weaves, dhurries, kilims, and hand-tufted rugs, made by highly-trained artisans using only the finest materials. 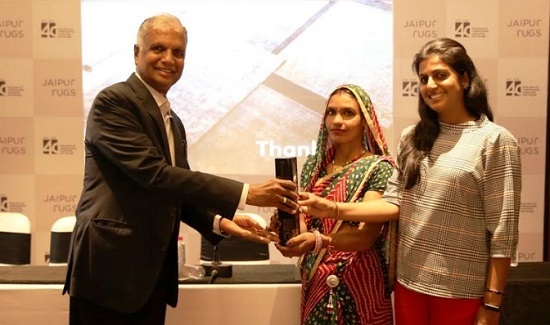 The not-for-profit Jaipur Rugs Foundation, which was set up in 2004, helps in skilling rural populations in rug-weaving and is engaged in helping the artisan community get access to health care, financial inclusion, education, among other things.